Luton striker James Collins has backed himself to score on his international debut for Ireland if he gets the chance this weekend. The 28-year-old made the cut after being named in the provisional squad recently, as he is now part of the 23-man squad for Euro 2020 qualifiers against Gibraltar on Saturday and then Georgia on Tuesday night. Collins, who has found the net for both the Irish U19s and U21s earlier in his career, said: “I didn’t really get my hopes up too much as I knew the squad was going to get cut, but when the news came through last Thursday that I’d made the cut, I was delighted. “I was always realistic to think that you had to play at a certain level to play for the senior squad. "The calibre of strikers that Ireland have had over the years, I always knew you had to maybe be Championship and above. "I’ve had to work my way up from the bottom and I’m really fortunate that the gaffer (Mick McCarthy) has given me a chance. “I’m scoring goals, I’m confident, and you can only play against the teams that are put in front of you. Hatters’ strike partner Danny Hylton would love nothing less to see Collins ripple the net, as he said: “I’m delighted for him, he’s a top guy. “A lot of people don’t know him except for what they see on the pitch, but he’s a top, top guy, a massive part of our environment, our dressing room. “He works hard, he’s always happy, he’s always positive, he’s great. “He deserves his chance, he’s been phenomenal, scored loads of goals. "He’s done it again this year, he’s been fantastic for us, a massive part of why we are where we are. 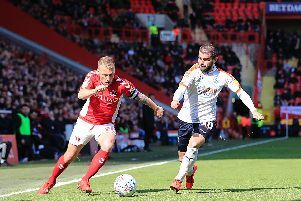 Collins, who has 20 goals in the league for the Hatters this season, will miss Saturday’s home match with Doncaster Rovers, but Hylton added: “That’s why we’ve got the squad we have. "We’ve got unbelievable talent on the bench, players that would be in any other team in this league.